Nikki and I went to Berlin in Germany during Easter 2010 and I have posted a trip report with photos, links and a Google map on http://gardkarlsen.com/Berlin_Germany_trip_report.htm . Berlin is a beautiful city and unfortunately we didn’t get to see enough of the city – but I guess that means that we have an excuse to re-visit Berlin in the In Berlin we checked out sights such as Pergamonmuseum, Brandenburger Tor, Third Reich walking tour, museum island, shopping at KaDeWe, the holocaust memorial and we even got to drive an old Trabant on a Trabi-Safari through the traffic of Berlin.Check out the trip report and get in touch if you have questions or comments. We arrived in Berlin in the afternoon and the Tegel airport is only located about 15-20 minutes from the city center and the taxi ride was 20€. There is also a bus option that can take you to some of the larger train stations in Berlin. I booked the room at the Westin on the Starwood Preferred Guest site and the rooms started at 99€ which is not bad for a 5 star hotel in a large European city – only a few years ago I had to pay about 90€ for a 2 star hotel in Paris. As we were a bit late at booking the room went up to 111€ including taxes but without breakfast. Check in at the hotel was fast and we got room 454. 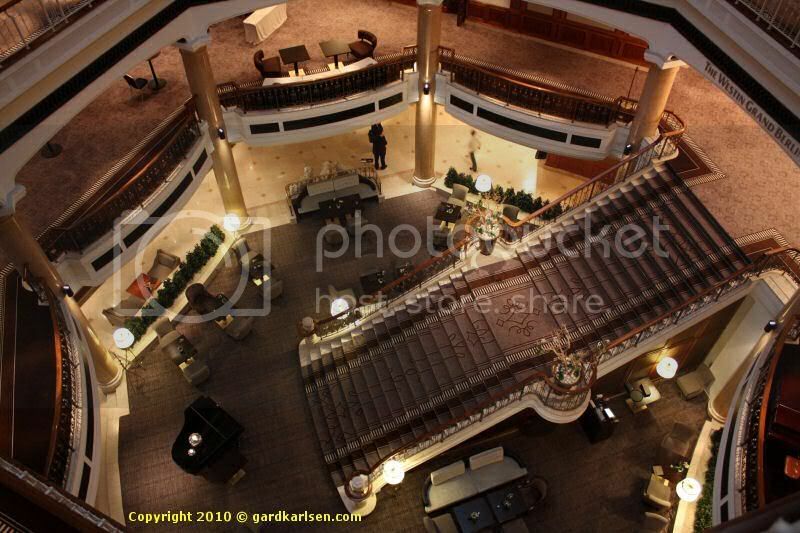 The lobby of the hotel is dominated by a huge and lavish staircase leading to the first floor where the breakfast is served and where they have conference rooms and you also have an open atrium up to the various floors. Our room was a standard size room but it seemed to be newly refurbished. The floor was covered in a brownish carpet while the walls were painted in a light color. Instead of a king size bed we had gotten two single beds standing next to each other but we knew about this in advance. 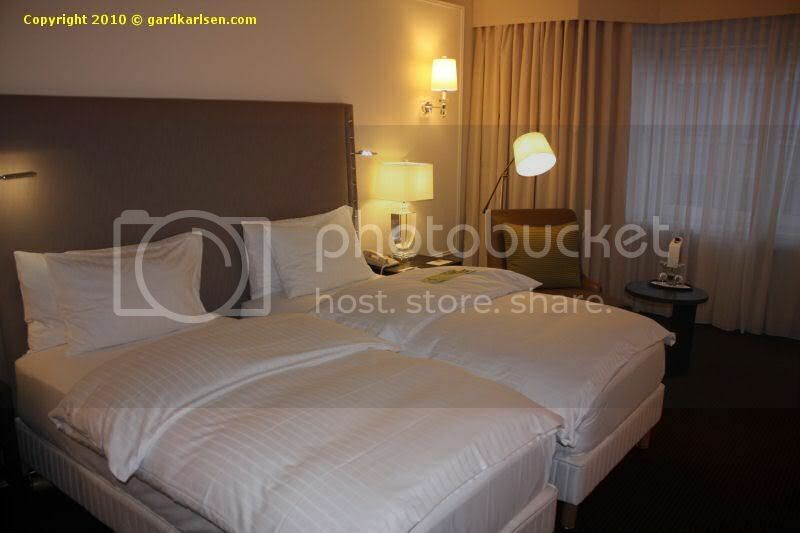 Westin (and Sheraton) keeps advertising about their heavenly bed and some of them are great. The beds at the Westin in Berlin were not that great in our opinion. First of all they were quite soft, the pillows were very thin and there seemed to be something in the mattress cover that made us sweat a lot at night. There were lots of lights in the room which I think is great and the windows faced Friedrichstrasse and the Bugatti showroom. We did hear a bit of the traffic noise but it was not a huge problem at night. 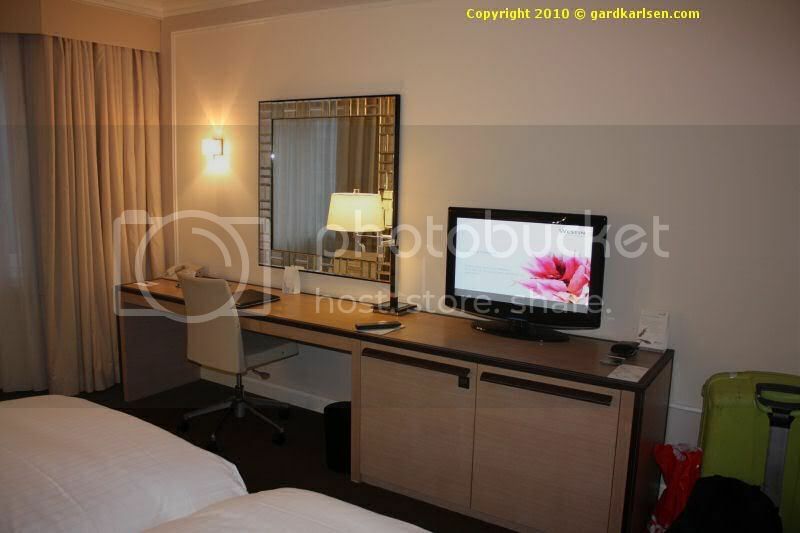 Apart from that we had one big chair in the room with a small table, a desk with a chair and a 32” flat screen TV. The TV had lots and lots of channels in German (and note that even English speaking movies are dubbed into German) so the only thing that was in English was channels like BBC News, CNN etc. But then again – you are not in Berlin to watch TV. 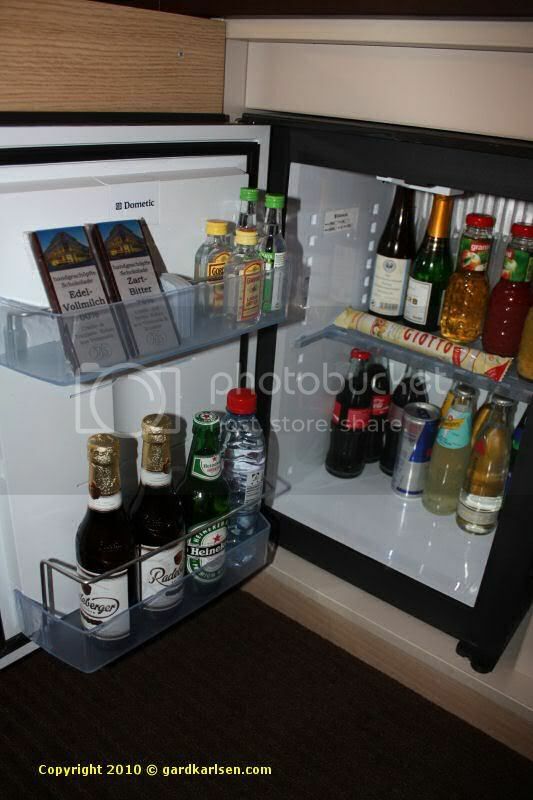 There was also a small fridge with items for sale – a Coke was 4.5 €, a Heineken 6 € and a small red wine was 10 € just to give you an idea of the prices. There were space for both our suitcases which was excellent as some hotel rooms seems to be designed for just one suitcase even if there is a king size bed meant for two people. 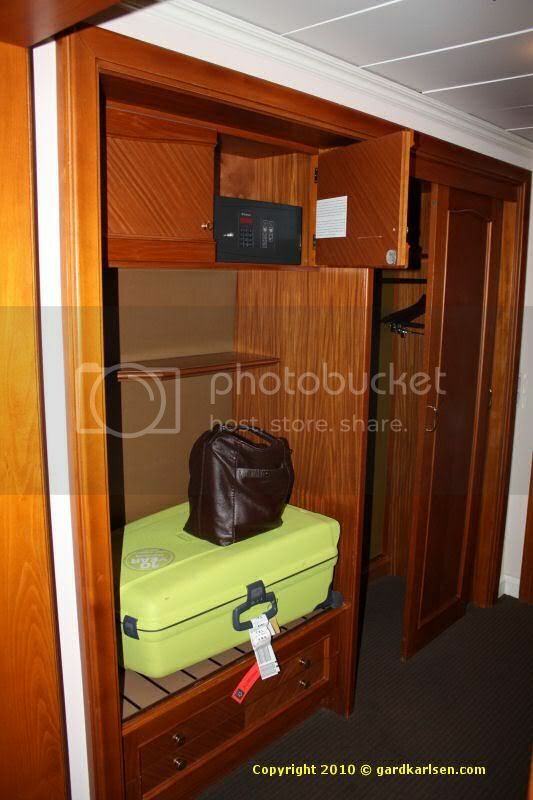 The wardrobe contained quite a few hangers and there was a small safe – there was even a power outlet in the safe which means that you can charge your cell phone when it is locked up. 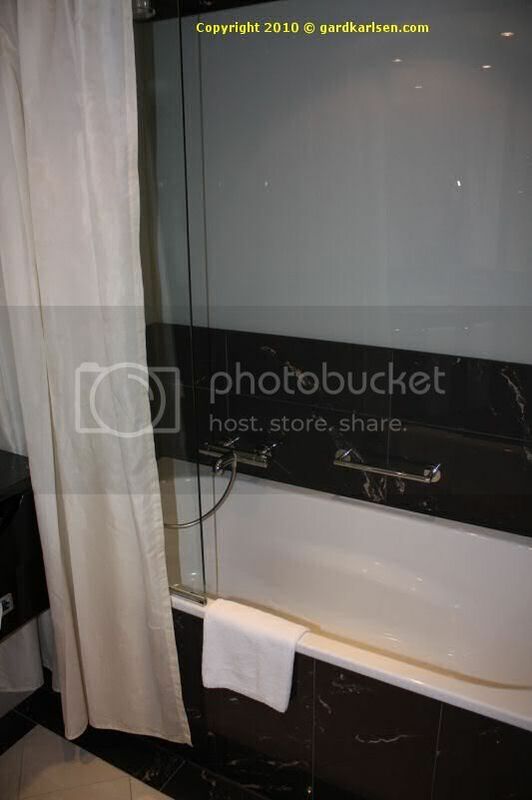 The bathroom was tiled with white and black tiles and contained a shower in the bathtub. There was a glass wall that prevented water from splashing everywhere when taking a shower and this combined with a shower curtain worked pretty good. It was fun to see that the standard amenities (like shampoo, shower gel etc) is the same that you get at the Westin in e.g. Bangkok. 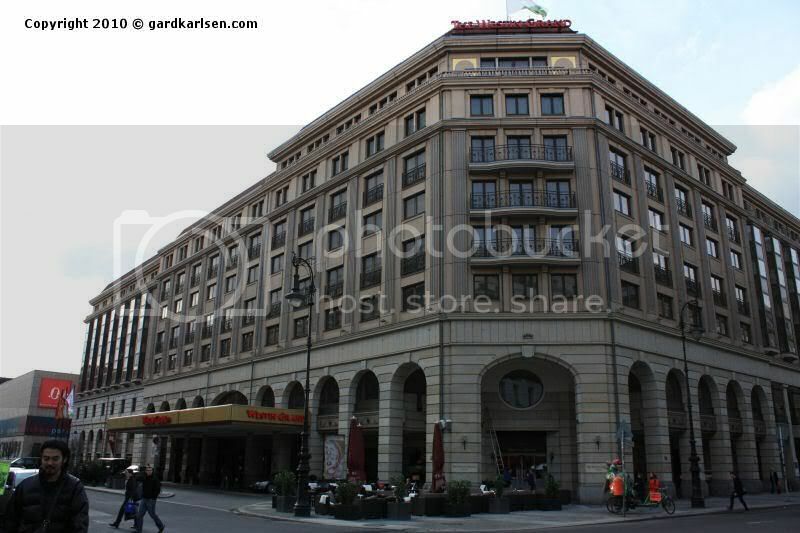 The location of the hotel is great – located on the corner of Friedrichstrasse and Unter den Linden you are basically in the middle of town and you can easily walk over to museum island or Brandenburger Tor. Right outside the door you will find the U-bahn station Französische Straße and you can also walk to the larger Friedrichstraße station to catch both U-bahn and S-bahn. There are lots of high-end shops in the area (we are talking Bugatti, Ferrari, Hugo Boss, Wempe watch store) together with department stores (like Galeries Lafayette Berlin) and lots of restaurants. One tip if you don’t have breakfast included at the hotel is to grab a bit at Einstein Coffee near the hotel. 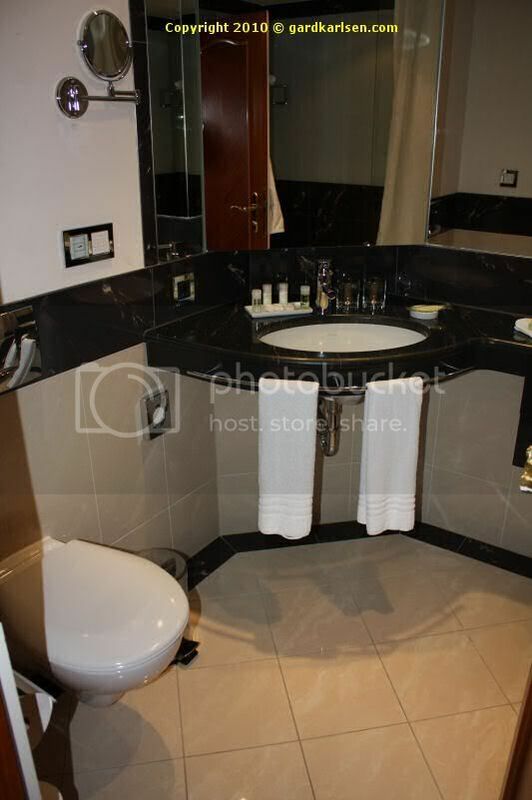 Let’s talk about some of the issues that were not that great with the hotel. First of all – no free internet! I’m not sure how others plan their trip these days but we are very much online planners and we make a Google map before we travel and we normally need to get online to check details. The internet was 7.5 € for 1 hour at the hotel – I would rather recommend that you go to Einstein coffee nearby to get free Wi-Fi and enjoy some coffee for the 7.5 € instead. The breakfast at the hotel was 29 € per person for the buffet which is way too expensive. Yes, you can order a la carte at the hotel but still. I’m sure it is a wonderful breakfast but for a person that normally just eats a small sandwich or some muesli it is not necessary to go for breakfast at the hotel – but luckily there are many small coffee shops and bakeries nearby. I have already mentioned that we were not that impressed with the beds. I also found it a bit strange that we only got one bathrobe and one pair of slippers when they knew that we would be two people staying in the room. It was not a big issue and I assume that we could have asked for another. We also had to request an iron and ironing board – the iron was good but the board needs to be replaced soon. One afternoon when we came back to the hotel we found a used cleaning cloth left by housekeeping on the desk – I have stayed at quite a few hotels but I don’t think I have seen that before.